Can Admin help to change the title to "2018 FIFA World Cup"
Edited by Civic2000, 02 December 2017 - 12:33 AM. When I shut my mouth and turn and walk away, it doesn�t mean you�ve won. It simply means that you are not worth any more of my time. seems like no group of death? 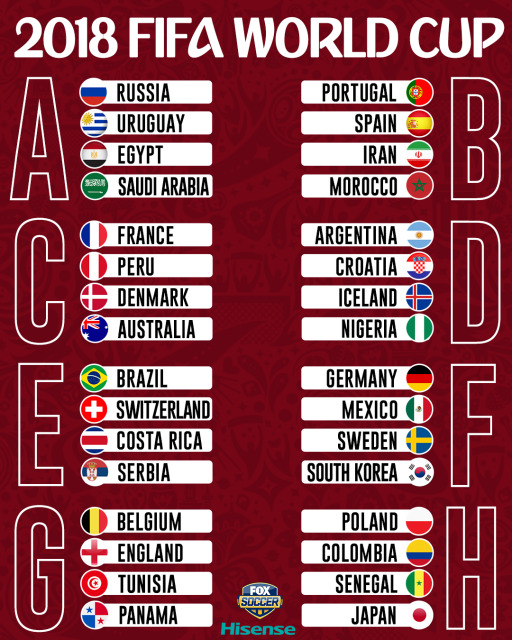 My eyes will be on Group C and F. France and Germany. I’ve been a supporter of the French team since the 1998 World Cup. I remember watching the finals then with my late Dad. That was also how my love for Arsenal started as a huge part of the French team were playing for Arsenal. Wha didn’t know u interested in football! My favourite team is England but they always flatter to deceive n have disappointed me for many years. 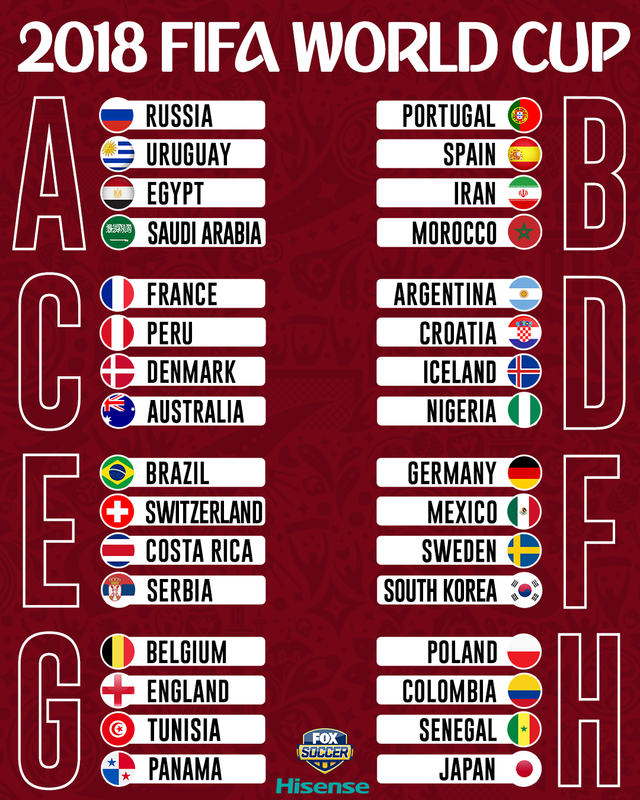 I guess the favourites will be Germany, Brazil, Argentina, Spain, France with possible Belgium as dark horses. Let the Finals begin......can’t wait!! Ya looks like no group of death but I guess group D looks toughest in my opinion cos Croatia is always a difficult team to beat, Nigeria is possibly the strongest African team n Iceland has since Euro16 come of age with incredible teamwork n never say die attitude. Wha didnât know u interested in football! My favourite team is England but they always flatter to deceive n have disappointed me for many years. I guess the favourites will be Germany, Brazil, Argentina, Spain, France with possible Belgium as dark horses. Let the Finals begin......canât wait!! Super crazy over football. But I stopped following a lot after I canceled my EPL subscriptions (back then still EPL). But once a gunner, always a gunner. Haha. 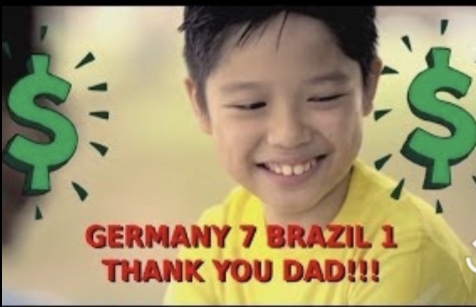 From the last World Cup. Iâve been a supporter of the French team since the 1998 World Cup. I remember watching the finals then with my late Dad. That was also how my love for Arsenal started as a huge part of the French team were playing for Arsenal. Wha always good to see more female supporters! I went to UK in Dec 2010 to watch some EPL games, it was my lifelong dream come true n the atmosphere from the cheering, taunting in the stadium continued after the match as the supporters walked to the tube station. It was memorable n something u can only experience there n particularly in sports mad countries where attending games are sort of a ritual. Actually my wife also not football fan but she and my daughter enjoyed themselves esp the taunting which was good natured. I was apprehensive at first cos I was worried it got out of hand between the supporters but luckily not. Obviously there will be some guys who are unruly but their security was top notch n the fans well segregated. I watched 4 games in total n the Kop singing their anthem at Anfield literally made my hair stand!! So passionate but the game of the tour was Arsenal v Chelsea at Emirates cos that was a local derby with the much hated Ashley Cole being jeered n derided throughout the match n even his wife Cheryl was not spared! Edited by Spring, 02 December 2017 - 09:57 AM. how old is Andy already? Edited by Wt_know, 02 December 2017 - 10:13 AM. I’ll place all my bets against favourites....it’s Russia. 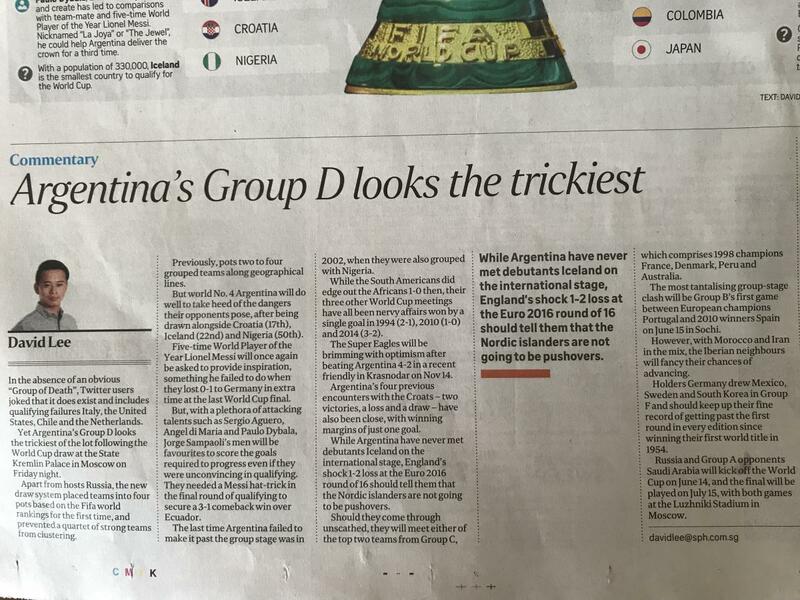 ST also agrees that Group D is the trickiest. Not exactly a group of death but it’s filled with teams who can upset the best of teams on their better days. Of The first round group of matches, 2 ties stand out- Belgium v England n Spain v Portugal. The latter match is the first game so both teams need to hit the ground running whereas the Begium v England game is the last group match so likely fight for top spot which has its own intrigue. Edited by Spring, 04 December 2017 - 09:40 AM. 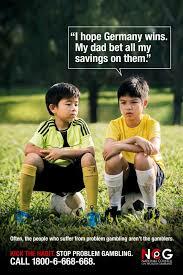 Where is that Gambling Dad ??? Russia, haha. I think will be the first going out.